The 42.29 metre motor yacht Ninkasi, jointly listed for sale by Burgess with Superyacht Sales & Charter, has been sold with the buyer introduced by Andrew LeBuhn at Camper & Nicholsons International. A Lloyd's-classed tri-deck motor yacht, Ninkasi was built in aluminium by Dutch yard Holland Jachtbouw to a design by Langan Design Associates and delivered in 2010. 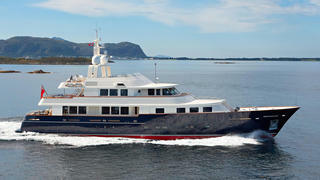 MCA compliant, her interior by Rhoades Young can accommodate up to ten guests in five cabins. The master suite is situated on the main deck and there are a further four cabins below, all with entertainment centres, Samsung television screens and en-suite bathroom facilities. Rhoades Young developed a classic ambiance for the interior, incorporating French Provencal finishes with elegant curves and flowing lines using weathered limed oak wood on the lower and main deck, changing to a more relaxed and nautical teak wood throughout the upper bridge deck. Classically designed symmetrical formality defines the main deck areas in the saloon and dining area and forward into the owner’s suite. A notable feature is a central spiral marble staircase, providing access to all three decks. The main saloon is an elegant and comfortable room with limed oak panelling and a subtle Asian decor motif. The floors are carpeted over hardwood flooring with the carpet being removable to allow for entertaining. Symmetrical seating has sofas on either side and four easy chairs, while teak French style double doors open to the aft deck. Large windows port and starboard make the saloon bright and airy. Twin 1,930hp MTU engines give her a cruising speed of 13 knots and a range of 2,450 nautical miles at 12.5 knots, increasing to 4,000 nautical miles at 10.5 knots.